High above the water on the winding road amidst the fingers of cliffs, I realize that I stopped being scared. Even when I said I wasn’t scared, I was scared. Never trust me when I say I’m not scared. Just like you should never trust me when I say I’m not drunk. But on the road in the morning as the landscape changed, as the cliffs reached higher and higher into the sky, I knew. I want to know when it happened, what city. To drop a plaque in that spot. Secrets work like poison, slow and without superficial trace. Say them out loud and you explode them to bits, boom like the Death Star. You obliterate them, shatter them into pieces. You will need to catch the shards, because they’re still yours. Pull them out of the air around you and dig them out of your wounds with tweezers and a needle. And build them into something, a mosaic of all the sadness you bore, all the nights you prayed no one would hear you, a masterpiece of what you were and what you became, the reason why you stand up straight, skip, dance on occasion, instead of lumbering hunched-over, heavy with the weight of it, never really knowing how it was working under your skin to kill you, turning your blood black, drop by drop. I cannot tell. I cannot ever, ever tell, even in cases where I am told that such things are obvious. Maybe I lack presumption, or maybe I only have one overriding presumption: That all men want to sleep with me. When it’s fully established that neither of them does, we decide to be friends and go hiking. They’re both from Chicago — Ravi is a GP and Tim teaches classes for gifted kids — and I like them immensely and immediately, so grateful for smart people, for actual humor, for people who have read the goddamn guidebook. Tim exudes sweetness and the kind of patient, understanding manner that I can imagine makes him insanely valuable in the classroom. Ravi is exacting and quick-witted, the engine that will carry them through Eastern Europe for three months, and then to South America for three more. They quit their jobs to do this. They saved for years. They’re grownups. 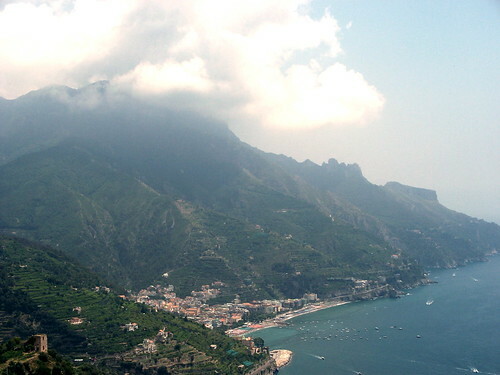 We hike with huge jugs of water up the cliff from pretty little Atrani on the coast to Ravello. At the bottom, we ask a woman if we’re going in the right direction. She says, “Ravello” and points to the sky. They have packed peanut butter and jelly sandwiches as a money-saving measure, but I opt for mortadella and provolone at a local deli, feeling guilty about the €2, knowing that I should be more responsible, that I should have peanut butter and jelly of my own. All the way up the cliff, I can smell the mortadella right through the paper. It drives me insane. I am so comforted by them, by their easy-flowing conversation, their openness. They always say. You meet so many people when you travel alone. And you do. But in the end, there are always only one or two. At the top of the cliff, in the cream-colored piazza of beautiful, wealthy, flower-strewn Ravello, a well-dressed crowd gathers in front of the duomo while we sit on a bench across the way and eat our sandwiches. My shirt is stained through with a single, giant sweat blob. I can still feel it running down my sides. I would rather be in a sundress and sandals. Sitting on the bench, I mentally pick out the outfit and try to ignore how I smell. Tourists in button-downs and polos, big straw hats, give us the eye. “An Indian wedding,” says Ravi. The bride ascends the steps. A small crowd of tourists that’s gathered on the piazza breaks into applause. When the doors close behind her, a chorus starts to sing. The hike down to Maori is supposed to be easier, but it’s not. It uses the down-stairs muscles instead of the up-stairs muscles, and mine quiver, begging for mercy, as we descend and descend, to the blue sea below. My plan is to sunbathe for a few minutes and then swim, but the sun is unbearable and my whole body aches. A streak across the hot sand. A plunge. I float, letting the salt water carry me to the surface. I don’t think about sunblock, about gunk in the water, about exhaustion. I think only about the sweet ends of things, of work and reward. It’s begun. I’m preparing to go home. I am in Positano, Italy, in a place that might seem like the most beautiful place on earth if I had not already been to so many beautiful places. I have been without regular Internet access, without a totally reliable phone line, without tons of money, without anything but 25 kilos of luggage, a bathing suit, two bottles of sunblock, and a stack of used bus tickets. I climbed a mountain today. And descended it. And swam in a lagoon at the bottom. This is the home stretch, then. The last place, places, is Greece. Because now I’m going to tell you something that you already know: If you want to go forward, go back to the beginning. I have more stories to tell you.